The painting is called Ulysses After The Shipwreck, and is by Jean-Charles Cazin. The poem Ulysses, by Alfred Tennyson, most often referred to as Alfred, Lord Tennyson, must surely be one of Tennyson's finest works. I reproduce it below. 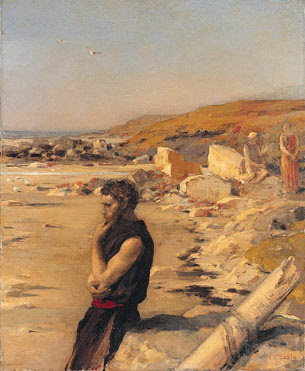 In Tennyson's Ulysses, the aging King, who has accomplished much, looks still towards the sea, and wants to travel more. "Old age hath yet his honor and his toil. Death closes all; but something ere the end. Some work of noble note may yet be done ... We are not now that strength which in old days moved earth and heaven, that which we are, we are, - one equal temper of heroic hearts, made weak by time and fate, but strong in will to strive, to seek, to find, and not to yield." With Tennyson and Ulysses whispering in my ear, I am off to visit Greece!